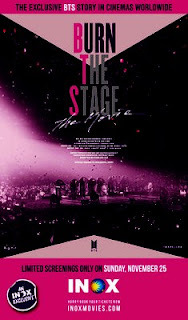 After the massive success of alternate content for its Fans, INOX brings to its guests, the exclusive screenings of a music concert documentary Korean film, Burn The Stage: The Movie (with English subtitles) on Sunday, 25th November at selected INOX locations. Burn The Stage, popularly known as the BTS Band or Bangtan Boys, is a seven-member South Korean boy band formed by Big Hit Entertainment. The band has originated in South Korea in the year 2013 and features in R&B, Reggae, Hip-Hop and EDM music genres giving heart-throbbing chartbusters to the world. 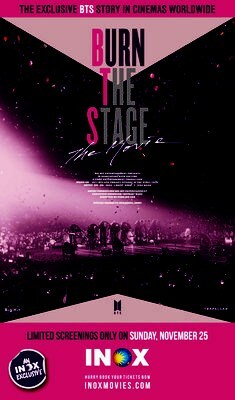 'Burn the Stage: The Movie', shows BTS performing on their world tour and features behind-the-scenes footage and interviews with the band. The Fans of BTS were eagerly waiting for the film to be screened in India since the last one month. And once the bookings opened, the shows were sold out like wild fire. The incredible rush resulted in houseful shows within few minutes of opening advances. In response to the fan support at the box office, more shows and more locations were added overnight to accommodate the die-hard fans. The movie is being screened only on Sunday, 25th November in 90 locations across the country.